HAEMAPHYSALIS ticks on LIVESTOCK, HORSES, DOGS and CATS. Biology, prevention and control. Haemaphysalis concinna, Haemaphysalis inermis, Haemaphysalis leachi leachi, Haemaphysalis longicornis, Haemaphysalis parva, Haemaphysalis punctata. Haemaphysalis is a genus of hard ticks found in Europe, Asia, Africa, and Australia. They affect cattle, sheep, goats, horses, camels, dromedaries, dogs, cats, and humans, but also a large range of wild mammals, birds and reptiles. There are about 150 Haemaphysalis species worldwide, with species-specific distribution and prevalence. Most species occur in Southeast Asia. Haemaphysalis concinna is found in Central Europe, East and Southeast Asia, China, Japan. It occurs in humid scrubby forests as well as in meadows and peatlands. It avoids dense forests. Haemaphysalis inermis is found around the Mediterranean, in East Europe, Near and Middle East. Prefers deciduous and mixed forests as well as grasslands. Haemaphysalis longicornis, the bush tick, the scrub tick. Is found in Australia, New Zealand, China, Japan, Western Pacific Rim, several Pacific Islands (e.g. Hawaii). Prefers mild and humid climates. Haemaphysalis punctata, the red sheep tick; Europe, Middle East, North Africa and Japan. It prefers moderate Atlantic climate but supports also mild continental climate. Usually it does not appear in large numbers. As a general rule, in the regions where they prevail Haemaphysalis ticks are less relevant for cattle and other livestock than those of the genus Amblyomma, Boophilus or Rhipicephalus in the tropical und subtropical regions. There are specific articles in this site on ticks in dogs and cats, as well as on ticks in horses. As all hard ticks, Haemaphysalis ticks are obligate parasites: they cannot survive without feeding blood of their hosts. Haemaphysalis ticks are of a small to medium size, i.e. engorged adult females reach about 1 cm length. They have short mouthparts and are of a yellowish to dark brownish color. Most Haemaphysalis species are three-host ticks, i.e. larvae, nymphs and adults can be found free-living in the environment waiting for a suitable host to pass by. Larvae and nymphs usually infect small mammals (e.g. rodents, rabbits, moles, but also reptiles and birds), whereas adults prefer larger ones, often dogs, but also livestock, wildlife and humans. The life cycle lasts 1 to 3 years depending on the species and on ecological and climatic conditions. As for all ticks, Haemaphysalis bites cause stress and blood loss to the hosts. A few ticks are usually well tolerated by livestock and pets, but infestations with dozens or hundreds of ticks can significantly weaken affected animals and cause weight loss, reduced fertility, decreased milk production, etc. 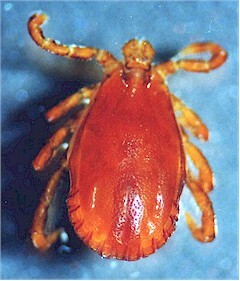 Haemaphysalis ticks are all vectors of several tick-borne diseases of livestock, pets and humans. Haemaphysalis concinna can transmit tularaemia, various Rickettsia species and several encephalitis viruses, etc. 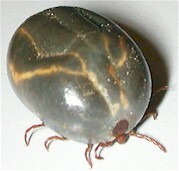 Haemaphysalis inermis can cause tick paralysis. Haemaphysalis leachi leachi can transmit canine and feline babesiosis, Mediterranean spotted fever, Q-fever, Boutonneuse fever, etc. Haemaphysalis longicornis can transmit several species of Rickettsia, Ehrlichia, Anaplasma, and Theileria as well as Q-fever. Haemaphysalis punctata can cause tick paralysis and transmits several microbial pathogens such as of Babesia, Anaplasma, Brucella, Theileria, Borrelia, tularaemia, Q-fever, tick-borne encephalitis virus, etc. Cebu cattle (Bos indicus) and numerous indigenous breeds are naturally resistant to ticks and tick-borne diseases, whereas European breeds (Bos taurus) are not. An obvious and proven method to reduce cattle tick problems in tick endemic regions is to increase the amount of B. indicus "blood" in the herds. This has been done successfully in a few regions. Unfortunately, in many other regions the opposite is more frequent. The reason is that producers are often urged to increase the productivity of their properties. Since they can neither reduce their costs, nor increase the cattle density of the farm, a rather cheap and easy option is to introduce more European "blood". It doesn't need significant investments or changes in the infrastructure and management of the property. Social and cultural factors also play a role: European breeds are often perceived as high-tech and prestige livestock. Pasture burning is a common practice in many regions of the world. Regarding cattle tick control, the experience is that it contributes to reduce the tick numbers to some extent, but it is certainly not enough to eliminate or substantially reduce the tick populations. And it cannot be practiced where livestock shares rangelands with wildlife, as in many regions where these ticks are a problem. Livestock alternation doesn't help at all with Haemaphysalis ticks, because they feed on most wild and domestic animals. Reducing the number of wild animals can have an impact on Haemaphysalis populations, but is often impossible or simply unwanted. Pasture rotation or vacation is not feasible with Haemaphysalis ticks: they can survive very long without feeding and there will always be enough wild animals around to support tick populations. Biological control of Haemaphysalis and other ticks using their natural enemies remains a research topic has not yet delivered really effective and sustainable solutions for tick population control. Tick predators such as insects (e.g. ants, wasps), small rodents or birds (e.g. cattle egrets, guinea fowls, oxpeckers, etc.) do in fact consume significant amounts of ticks, but will not eliminate tick populations. One reason is that they are not specific tick predators, but feed on whatever is available. The most promising results have been obtained so far with so called entomopathogenic fungi, i.e. fungi that are pathogenic for ticks and other insects (e.g. Beauveria bassiana, Metarhizium anisopliae, etc.). In certain countries there are commercial products for crop protection based on such fungi, and there are reports that they can effectively control ticks on cattle too. However, a systematic commercial approach to tick control using such fungi is still missing. In addition, such biological control methods target tick population control and not protection of single animals or knocking down already attached ticks on an infected animal. For the reasons previously mentioned population control of Haemaphysalis ticks is virtually impossible in most endemic regions. There are no specific vaccines against Haemaphysalis ticks. A few reports have shown efficacy of the Boophilus tick vaccine against other tick species, but little is know about its effect against Haemaphysalis ticks. There are no repellents, chemical or natural, that effectively prevent Haemaphysalis ticks from attaching to livestock or pets, or that cause already attached ticks to detach. There are no traps that effectively reduce tick populations in the pastures: whatever domestic or wild animals are much more attractive for ticks than any possible trap. So far there are no herbal remedies commercially available really effective for protecting livestock from Haemaphysalis ticks in endemic regions. All are for on animal use. In most countries there are currently no tickicides approved for pasture treatment against cattle ticks. The major reason is that to effectively control the ticks on pasture the dose will be lethal for almost any invertebrate fauna in the pastures and for most of the vertebrates that feed on them (birds, reptiles, rodents, etc.). In addition, pastures would be also contaminated with chemicals, which could be toxic for livestock or leave illegal residues in meat and/or milk. Organochlorines were vastly used in the past, but are now prohibited for livestock in most countries. Neonicotinoids are not effective against ticks. Carbamates are often not effective enough against ticks. These veteran acaricides are mostly available as concentrates for topical administration as dips and sprays, or as ready-to-use pour-ons. As a thumb rule, dips are more effective than sprays and pour-ons, simply because sprays and pour-ons do not ensure a complete coverage of the whole body (e.g. ears, udders, perineum, below the tail etc.). Insecticide-impregnated ear-tags, dusts and back rubbers are not suited for the control of most Haemaphysalis ticks. Neither macrocyclic lactones (e.g. doramectin, eprinomectin, ivermectin, moxidectin), nor tick development inhibitors (fluazuron) ensure adequate control of Haemaphysalis ticks on livestock (or any other multi-host tick species). This means that there are no systemic tickicides suited for controlling Haemaphysalis ticks, and consequently neither injectables, nor drenches nor feed additives. Click here to learn more about general features of parasiticides. Click here to learn more about delivery forms of parasiticides. If available, follow more specific national or regional recommendations or regulations for tick control. There are no reports on serious resistance problems of Haemaphysalis ticks on livestock, horses or pets. This means that if a tickicide fails to achieve the expected efficacy, chance is almost 100% that either the product was unsuited for Haemaphysalis control, or it was used incorrectly.